This Easter, Acer is rewarding Facebook fans with an interactive online hunt from 11 April – 22 April. 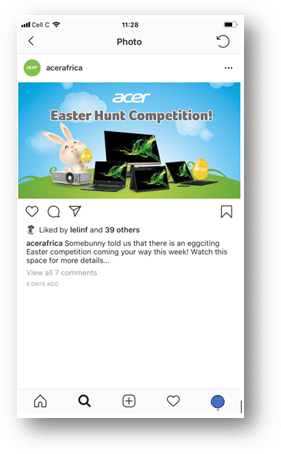 The digital hunt is aimed to engage and reward fans by prompting them to answer product related questions on some of the device available for discounted deals on ShopAcer during Easter. There are three, R 2000 ShopAcer vouchers up for grabs daily until 17 April. Additionally, a R4000 voucher will be in play on Easter weekend from 18 April – 22 April, where winners will be announced on 22 April.